Masaru Kibukawa from Cascadia Community College speaks to students at the fall 2011 StudyUSA Community College Fair in HCMC. Vietnam now ranks 8th among all countries sending students to the US, according to the 2011 Open Doors international academic mobility report, with nearly 15,000 students, three-quarters of whom are undergraduates. Of that 75%, the majority begin their studies at a community college. 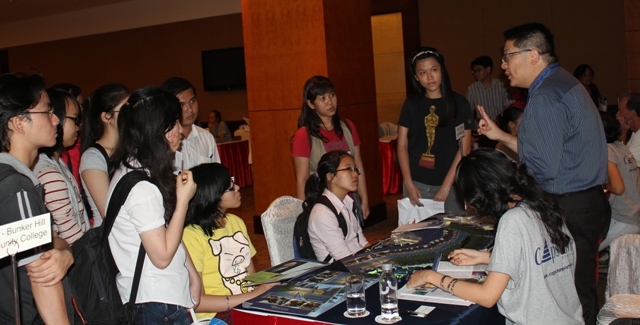 Capstone Vietnam’s StudyUSA Community College (CC) Fairs in Vietnam cover all three regions of the country and enable community college representatives to meet with students and parents who are interested in learning about the advantages and benefits of a community college experience. Carola Smith from Santa Barbara City College and her student volunteer speak to a parent at the HCMC fair. For more information, follow these links to fair information and online registration. Disclosure: I’m managing director of Capstone Vietnam, a Hanoi-based human resource development company.